Federal officials will know in two weeks who will protest a plan to preserve sage grouse habitat across 10 western states, including Wyoming where a critical winter strategy remains undeveloped. 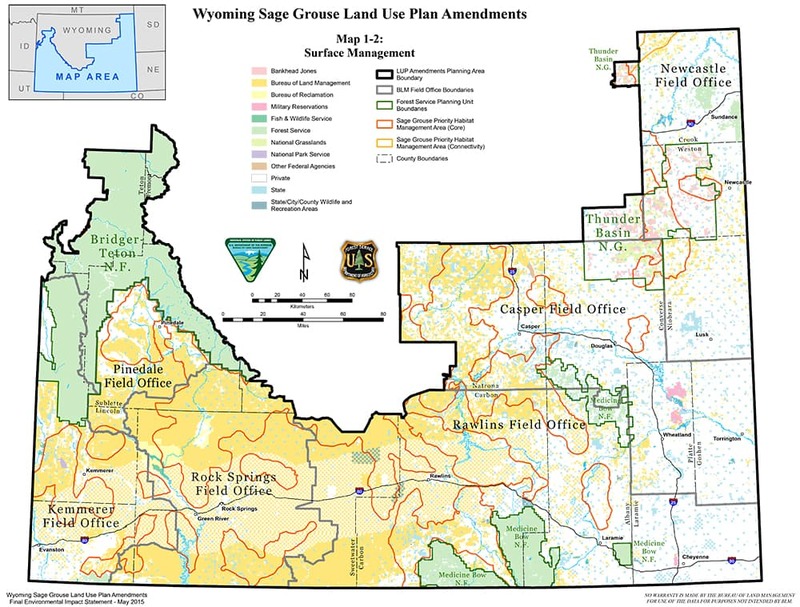 Bob Budd, head of Wyoming’s Sage Grouse Implementation Team, hailed as “epic” the Bureau of Land Management and Forest Service’s recently completed update of land management and conservation measures across 19.8 million acres in Wyoming. Considered the largest conservation effort ever undertaken in the U.S., the plans designate 8.3 million acres in Wyoming as priority habitat where destroying sagebrush would be limited or banned. Of that, 1.2 million acres would be “sagebrush focal areas” essential to the species’ survival. The plan for Wyoming and the other states would also reduce the threat of rangeland fire. Wildfire is one of the greatest threats to greater sage grouse, in part because of the increasing invasion of flammable cheatgrass, which replaces sagebrush in burned areas. The goal of the conservation plans is to convince the U.S. Fish and Wildlife Service that measures are in place to stop the bird’s decline. If that agency agrees, it would no longer consider the greater sage grouse warranted for protection under the Endangered Species Act — a determination the Fish and Wildlife Service must make by the end of September. 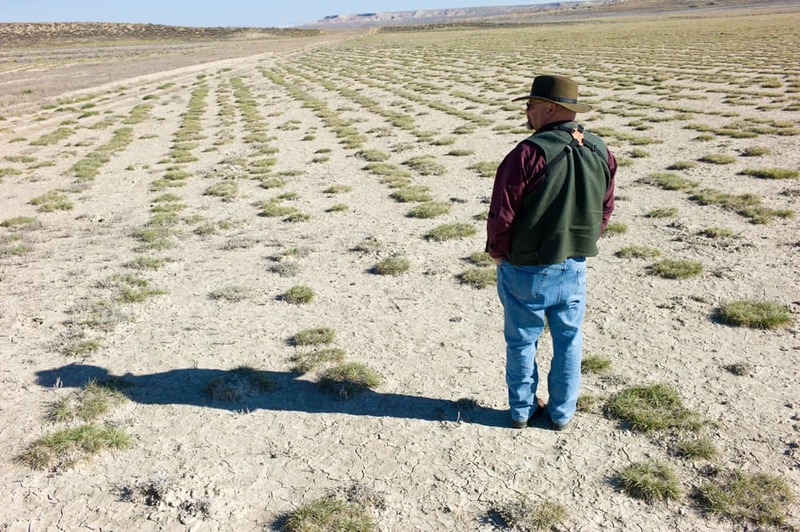 The effort is as much about those who make their livings in the sagebrush sea as it is about the greater sage grouse. “These plans do not impact valid existing rights,” Jewell said. Oil and gas investors who have leased federal property for development won’t be denied that opportunity, an essential element for Gov. Matt Mead (R). If the grouse were listed, Wyoming would stand to lose nearly 4,000 jobs, more than 1,600 of those in oil and gas alone, according to David Willms and Anne Alexander. They outlined the potential impact of an endangered species listing in a 2014 article in Wyoming Law Review. The analysis applied to Wyoming’s core grouse areas only. In part because of those stakes and despite Fish and Wildlife’s September deadline, political efforts in Washington, D.C. seek to prevent a listing, regardless of biology. Wyoming’s Congressional delegation backed one delay last year. They proposed a bill that would delay any listing for years with the stated purpose of allowing state conservation plans to run their courses. Congress has not passed the measure. A separate FY 2015 budget rider prevents implementing any listing decision for the bird for now. But that prohibition would expire with adoption of the FY 2016 budget, expected this fall. The most recent Washington D.C. politicking that would prohibit federal protection argues that the greater sage grouse — about the size of a chicken — would endanger U.S. military readiness if it were listed. President Obama has signaled disdain for that effort. The military funding bill “includes non-germane provisions, such as those undermining the Endangered Species Act, that have nothing to do with national defense,” an administration policy statement issued last month said. “If this bill were presented to the President, the President’s senior advisors would recommend to the President that he veto it,” the statement said. While the political wrangling continues, Fish and Wildlife continues with its task. It will decide on the grouse’s status in September, regardless of whether a law blocks the agency from actually taking action to preserve the bird. Wyoming and Jewell’s Department of Interior— parent agency of the U.S. Fish and Wildlife Service — appear united over greater sage grouse conservation. However, questions remain regarding how to protect a winter concentration area in Sublette County where 1,500 to 2,000 birds flock. There and nearby, Jonah Energy has proposed drilling 3,500 wells in the Normally Pressured Lance field. 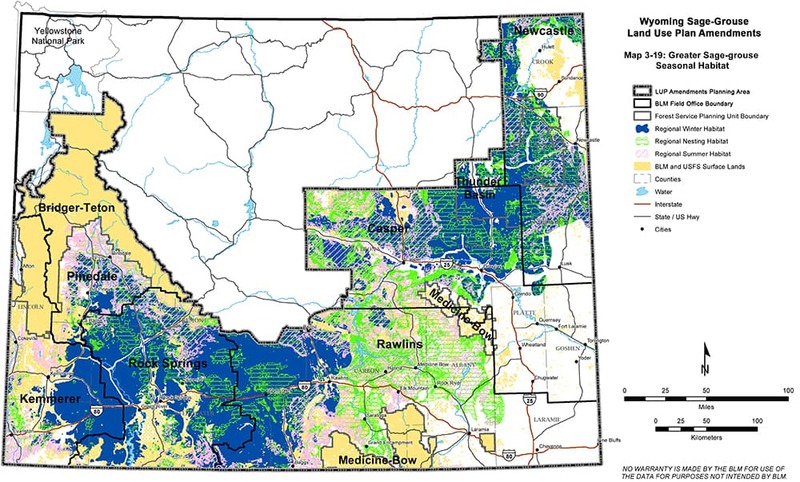 As the federal government prepared its most recent Wyoming plans, some industry representatives protested one map that depicted winter habitat across much of the NPL and other parts of the state. The map was too general and unsupported, critics said. 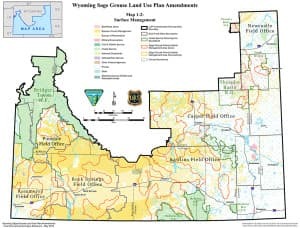 The BLM deleted the map from the final plan that covers six Wyoming BLM districts and three national forest units. This occurred even though the Environmental Protection Agency wrote it was “concerned” that the BLM plans “may not fully protect substantial winter habitat.” Now, the federal government will make its decision in September based on assurances in Gov. Mead’s Greater Sage Grouse Executive order that Wyoming will study and impose winter habitat protections. Budd’s Sage Grouse Implementation Team had an opportunity to protect the winter concentration area this spring by extending the state’s core-area protection. That move would have essentially cut Jonah’s proposed drilling plan by three-quarters. Instead, Budd has reactivated a SGIT sub-group that will address the site-specific winter conflict. Budd’s team’s work won’t be completed by Fish and Wildlife’s September deadline. But that shouldn’t worry the federal agency, Budd said. Wyoming and Jonah have promised no drilling in the NPL-area winter concentration areas until the state develops standards for protecting grouse there. Habitat, structures and human presence are key elements in winter protection, Sattelberg said. There’s some literature that defines winter habitat and the characteristics that make it valuable, including height of sagebrush and depth of snow. What effect structures have on wintering birds — whether greater sage grouse would avoid a shed or fence, for example — are largely unknown. One proposal is to restrict activities in winter concentration areas from December 1 to March 14. Exactly what such stipulations would entail still is up in the air, however. Budd and Sattelberg agree greater sage grouse protection in winter is unfinished business in Wyoming, but that the Wyoming plan could satisfy the Fish and Wildlife Service. “I don’t think anybody on the existing team is going to do that,” the SGIT leader said. If the winter study group proposed ineffective protections, Sattelberg would be there to disagree. An ineffective rule, “that’s not going to go anywhere,” Budd said. Wyoming plan an Achilles heel? 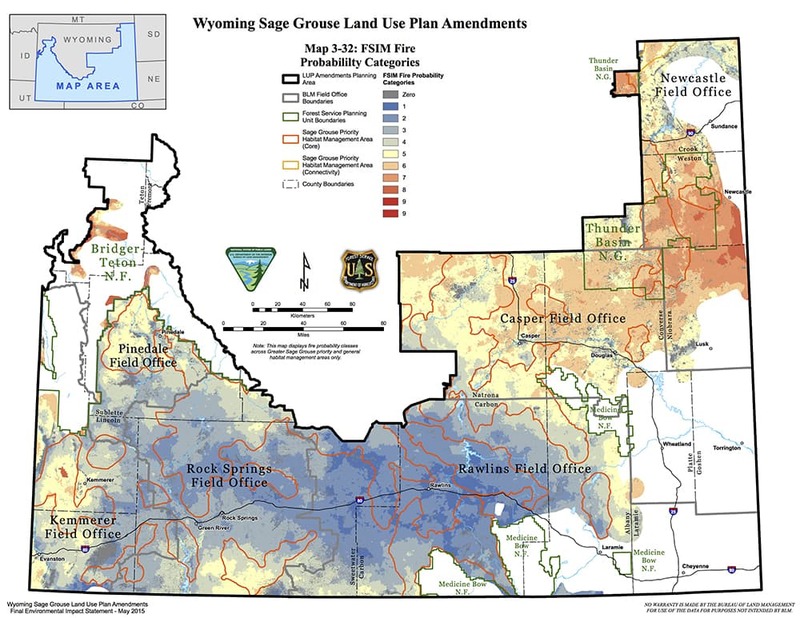 Despite the positive proclamations by Jewell, Mead, Budd and others at the unveiling of the Wyoming and national plans last month, several conservation groups disagree the protections will be adequate. They have slightly less than two weeks to protest to the BLM and Forest Service. Wyoming is the “Achilles’ heel” of federal conservation efforts, according to WildEarth Guardians. “New plans intended to rescue the sage grouse from the brink of extinction will open the door for a flood of oil and gas fracking, mining, and loosely-managed livestock grazing across the most sensitive sage grouse habitats that remain in Wyoming,” the group said in a statement. Ranchers have been active in conservation, however. A February, 2015 report by the Natural Resources Conservation Service outlined some of the results. It was back on July 2, 2002, that the U.S. Fish and Wildlife Service received a petition from Craig C. Dremann to list Centrocercus urophasianus as endangered across its entire range. It was the first request to protect all American greater sage grouse. Dremann is a 61-year-old self-taught Redwood City, California range restoration professional who began his business The Reveg Edge when he was in high school. In 1997 he had packed up his ’94 Saturn for a 2,000 mile trip to South Dakota where he was to give classes, including one along the way in Buffalo. The odyssey would become the foundation for his petition. Dremann decided he would keep a journal — actually about ten 3×5-inch notebooks — documenting the vegetation at one-mile intervals. 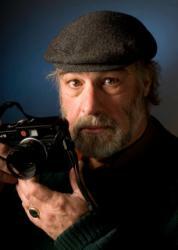 From his previous work, he knew native grasses and plants were missing from a large part of the sagebrush sea. It may have been easy for the U.S. Fish and Wildlife Service to dismiss Dremann’s windshield observations. By his own admission he’s “never gone to college … just learned as I went … read a lot of books and talked to the elders.” But national conservation groups began to join the hue and cry until, in 2004, the agency launched the endangered species investigation that continues today. Despite years of work, sides remain divided about whether the greater sage grouse will persist. “The sage grouse is just a little, little, tiny piece of this huge Titanic that’s hit the iceberg and is sinking,” Dremann said. “It’s only one person on the deck.” What’s dragging it down is the unraveling of the sagebrush sea ecology. Budd sees sage grouse conservation in a different light. Wyoming’s efforts are perhaps more akin to rowing a much-needed lifeboat. “To think our team in Wyoming has been at this for eight years, that the team has not fractured, that the meetings are civil, cordial, fair, based in biological reality…” he said. SGIT has operated through two governors, two presidents, three Interior Department secretaries and two Wyoming Game and Fish Department directors. Its members have seen 25 children or grandchildren born since the group first assembled in 2007. — Dustin Bleizeffer contributed to this story.